Great 4 bedroom villa 3 bath in Lake Berkley resort for amazing vacation near Disney in Orlando Florida. Lake Berkley Resort is an upscale gated community, which lies in a quiet secluded enclave of luxurious private homes. At Lake Berkley you can enjoy a clubhouse with a fitness center, community swimming pool and spa, tennis courts and a children’s playground. The resort is located just 5 miles from Disney. Our beautifully upscale, furnished home is spacious and comfortable featuring high ceilings and a bright and airy atmosphere. The home consists of a large kitchen, dining area, living room, dining room, family room, king master bedroom with ensuite bath, queen second bedroom, two twin bedrooms, pool bath, and laundry room. The kitchen is fully equipped with dishwasher, microwave, coffee machine, blender, toaster, dishes, glasses, pots and pans. You can expect to find everything you would have in your own home. Sliding patio doors from the master bedroom and family room open onto a screened patio, which makes a delightful eating area by the private pool. We have a larger than standard pool and extended pool decking for added pleasure. 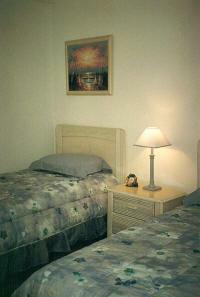 The living room and family room have beautiful and comfortable sofas, both queen beds and custom window works. We also have for our guests pleasure a Game Room. We have provided five TV’s (Cable), 2 VCR’s, 2 DVD players and a CD/stereo system for your pleasure. You will also find videos, books and and Wii with numerous "cool" games for your entertainment. The T.V. in the Family room is Flat Screen HD. The home is equipped with a Laptop Computer and Wi-Fi. Our phone service allows Free Telephone calls to Puerto Rico and the Continental U.S. and Canada. The location of our home is ideal - just minutes from all the area attractions, fine dining and shopping. Truly a home away from home. We visit our home several times throughout the year to ensure that you will have a pleasant stay. Our Property Management Company is only minutes away and are available 24 Hours per day.